For most of the New England Patriots, it’s back to business – as the players continue to take part in voluntary offseason training. The keyword here is voluntary – and we all know two major players taking advantage of that, as Tom Brady and Rob Gronkowski have yet to be seen at Gillette Stadium this offseason. While they are away, the others must play. Backup quarterback Brian Hoyer took part in most of the reps at the team’s voluntary OTAs on Tuesday. Just like the Patriot Way, Hoyer is focused and not letting anything interfere with the game. "I look at it as a great opportunity to be out there,” Hoyer continued. “Be the guy that's in charge of the huddle, lead those guys, get to know the guys that were here last year a little bit better and get to know the new guys too. It's not unique at all. I've been other places where I've been the guy responsible for leading the huddle, being that guy, that presence there, the leadership, those type of things." 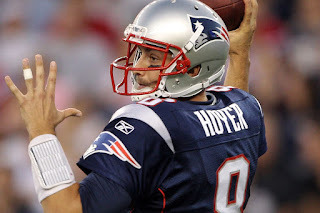 Hoyer was joined by Danny Etling, a 2018 seventh-round draft pick out of LSU, as the only two quarterbacks on the field that day. While Hoyer, Etling and the Patriots were practicing behind Gillette Stadium on Tuesday, it was reported by the Boston Herald that Brady was doing an individual workout at the TB12 Sports Therapy Center.